The United States Army Command and General Staff College (CGSC or, obsolete, USACGSC) at Fort Leavenworth, Kansas, is a graduate school for United States Army and sister service officers, interagency representatives, and international military officers. 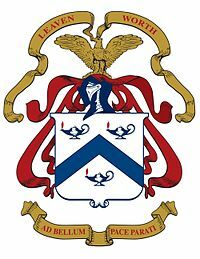 The college was established in 1881 by William Tecumseh Sherman as the School of Application for Infantry and Cavalry, (later simply the Infantry and Cavalry School), a training school for infantry and cavalry officers. In 1907 it changed its title to the School of the Line. The curriculum expanded throughout World War I, World War II, the Korean War, and the Vietnam War and continues to adapt to include lessons learned from current conflicts. In addition to the main campus at Fort Leavenworth, the college has satellite campuses at Fort Belvoir, Virginia; Fort Lee, Virginia; Fort Gordon, Georgia; and Redstone Arsenal, Alabama. The satellite campuses provide non-residential distance learning opportunities. The United States Army Command and General Staff College (CGSC) educates and develops leaders for full spectrum joint, interagency and multinational operations; acts as lead agent for the Army's leader development program; and advances the art and science of the profession of arms in support of Army operational requirements. Fort Leavenworth's Eisenhower Hall houses the CGSC Library. Command and General Staff School (CGSS) provides Intermediate Level Education (ILE) for United States Army and sister service officers, interagency representatives, and international military officers. ILE is a ten-month graduate-level program; the curriculum includes instruction on leadership philosophy, military history, and the military planning and decision-making processes. There is one ILE class per year; starting in August and ending in June. About 1,200 US military and international officers make up the class. In addition to the ILE curriculum, a graduate masters program exists for students who may qualify to complete a thesis-level research paper and receive a Master of Military Arts and Sciences (MMAS) degree at the School of Advanced Military Studies. The Masters program is accredited by the Higher Learning Commission, the accrediting body for collegiate institutions in the midwestern United States. ILE students are normally mid-career field-grade officers preparing for battalion command or staff positions at the division, brigade, or battalion level. In addition to CGSS at Fort Leavenworth, the school operates satellite campuses at Fort Belvoir, Virginia; Fort Lee, Virginia; Fort Gordon, Georgia; and Redstone Arsenal, Alabama. Students at the satellite campuses complete the ILE Common Core, a condensed ninety-day program without the MMAS option, in lieu of the traditional ten-month program. School of Advanced Military Studies (SAMS) provides post-ILE instruction on complex military issues at the strategic and operational levels. Students who complete the curriculum receive a Master of Military Arts and Sciences (MMAS) and are then assigned as high-level military planners. The Masters program is accredited by the Higher Learning Commission, the accrediting body for collegiate institutions in the midwestern United States. School for Command Preparation (SCP) provides instruction for colonels, lieutenant colonels, and command sergeants major who have been selected for brigade or battalion command. Courses are normally three to four weeks and focus on special topics unique to assumption of command at the levels indicated. School of Advanced Leadership and Tactics (SALT) provides officer continuing education towards developing the Scholar-Warrior-Leader from first lieutenant to selection for major. The result is mastery of branch-specific technical and tactical skills, staff processes in battalions and brigades, direct leadership and command competencies, and initial broadening opportunities. During World War I, the CGSC at Ft. Leavenworth was closed, from 1916 until 1920. Most of the school staff was sent to Langres, France, to open and conduct the Army General Staff College, which operated from November 1917 to December 1918. This compressed-curriculum school was needed to provide command and staff officers for the exponentially growing number of Army units; divisions, regiments, brigades, and battalions. The college reports that 7,000 international students representing 155 countries have attended CGSC since 1894 and that more than 50 percent of CGSC International Military Student (IMS) graduates attain the rank of general. Brigadier General Muhoozi Kainerugaba son of Ugandan president, 2007–08. Général d'armée René Imbot, Chief of Staff of the French Army, General Director of DGSE, France. Since 1976, the commandant of the college has been a lieutenant general. David Petraeus was the commandant between 2005 and 2007, immediately before going to command the Multi-National Force – Iraq. ^ "CGSC Leadership". U.S. Army Command and General Staff College. Archived from the original on 1 January 2017. Retrieved 13 February 2017. ^ Otis, E. S. (1882). "8.—Report of Col. E. S. Otis". In United States War Department (ed.). Report of the Secretary of War; being part of the message and documents communicated to the two Houses of Congress at the beginning of the second session of the Forty-seventh Congress. In four volumes. I. Washington: GPO. pp. 173–177. Archived from the original on 27 October 2015. Retrieved 11 August 2013. (p.173): "As directed by the General of the Army, in communication of September 27, I have the honor to submit the annual report of proceedings and results at the United States infantry and cavalry school here located, or for the period from December 1, last, the date of its organization, to the present time. The school was organized under the provisions of General Orders No. 42, War Department, of May 7, 1881, which provided that the commanding general of the Department of the Missouri should, as soon as the requisite number of companies could be assembled at Fort Leavenworth, take measures to establish a school for infantry and cavalry similar to that in operation at Fort Monroe for the artillery arm of the service." ^ a b c "About the Command and General Staff College". U.S. Army Command and General Staff College. Archived from the original on 12 September 2013. Retrieved 11 August 2013. ^ a b "About the U.S. Army Command and General Staff College". CGSC Foundation. Archived from the original on 5 November 2013. Retrieved 11 August 2013. ^ a b "CGSC Registrar". U.S. Army Command and General Staff College. Archived from the original on 6 March 2013. Retrieved 11 August 2013. ^ a b "Satellite Campus Program". U.S. Army Command and General Staff College. Archived from the original on 20 August 2013. Retrieved 11 August 2013. ^ "School of Advanced Military Studies – Converting intellectual power into combat power". U.S. Army Command and General Staff College. Archived from the original on 18 October 2013. Retrieved 11 August 2013. ^ "School for Command Preparation". U.S. Army Command and General Staff College. Archived from the original on 10 October 2013. Retrieved 11 August 2013. ^ "School of Advanced Leadership and Tactics". U.S. Army Command and General Staff College. Archived from the original on 21 August 2013. Retrieved 11 August 2013. ^ "International Hall of Fame Induction Ceremony". U.S. Army Command and General Staff College. 1 October 2009. Archived from the original on 2 November 2013. Retrieved 11 August 2013. ^ "US embassy cables: Bahrainis trained by Hezbollah, claims King Hamad". The Guardian. London. 15 February 2011. Archived from the original on 15 September 2014. Retrieved 11 August 2013. ^ Halloran, Richard; Molotsky, Irvin (14 December 1988). "Washington Talk: Briefing; A Hero Retires". The New York Times. Archived from the original on 24 May 2013. Retrieved 11 August 2013.